i am new to ka-sat, tooway and in this forum. I am trying to fix tooway equipment by using beeper. Beeper is beeping continuesly but after each 3 mins it is not beeping continuesly. I am adjusting to beep continuesly but then again it is not beeping continuesly. i tried all beam colors. but the purple one has the highest signal strength. "kasat finder shows my beam color is blue." this signal strength is enough to active it? 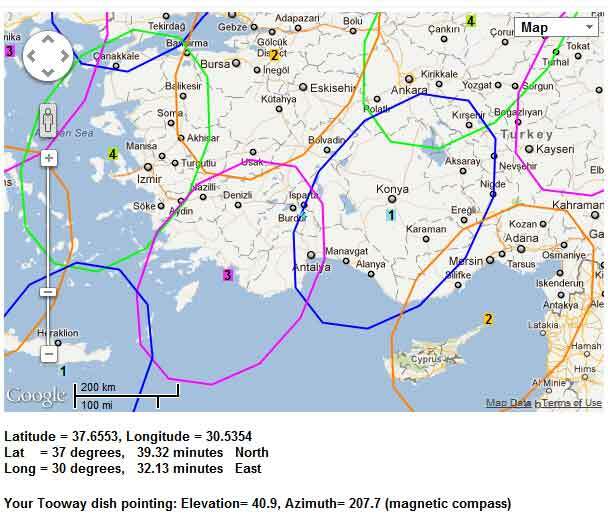 shows the map below and your location in Turkey, relative to the KA-SAT spot beam patterns. If you enlarge the scale till you see your house the blue line shows the direction of the satellite. You should be able to get a good signal from either the pink beam (3) or the Blue beam (1). I understand that as long as you peak up on some signal from KA-SAT the system will then find the best signal of all possibles, by trying each in turn, changing the polarisation as necessary (listen for clicks from the polariser in the TRIA). The intermittent beeping should become continuous when the beam peak gets near the satellite and the modem demodulator locks to a carrier. Then peak up, listening to the continuous tone, in azimuth and elevation. Repeat the peaking till you are sure you are in the exact centre. Look at the RX and TX LEDs. If RX is slow blinking (1 sec) then it it trying to acquire the downstream carrier. If RX is fast blinking (0.5 sec) then it it doing the ranging and registration process. If RX is solid ON then it is finished and NORMAL. If TX flashes it is transmitting burst. SNR = 13dB in in clear sky at beam edge is satisfactory. If your terminal appears to keep cycling, looking at difefrent beams etc., then it is possible that your site has not yet been set up at the hub. Call your service provider and tell them you are pointed and get their help. Maybe they need to tell the Skylogic hub that you are ready. Make sure they have the correct MAC address/serial number etc from your modem. can you check the position of dish? 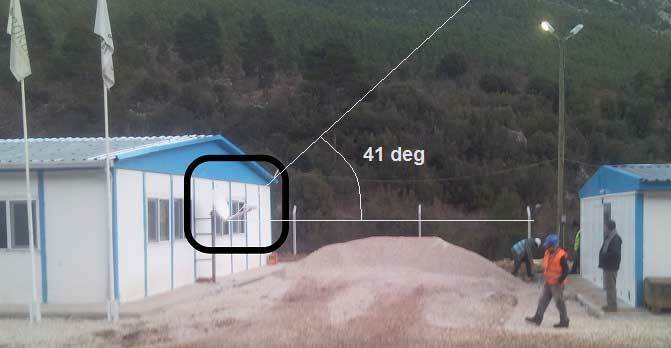 other building, which is right side, can block the signal? I've marked the 41 deg elevation line. �It goes well above the nearby building. You can get a good idea of the beam direction by putting your eye behind the lower edge of the dish and sighting across the top of the circular aperture of the conical feed horn. This is approximately the direction of the lower edge of the beam for an offset antenna. If you are peaked up and have SNR=13 dB then call your service provider and tell them, and ask them to activate you site. can u please check again?